The sofa is the heart of the living room. It is here we relax, watch, chat, eat, listen and enjoy ourselves and others company. Although living-room furniture comes in every colour imaginable, we generally end up choosing a shade that is timeless and neutral. And you know what? That is actually a fantastic starting point for staying on trend, our blank canvas. We’ve all been there. The seasons change, the days become shorter and the dark of autumn comes creeping in. Those fresh summer colours seem out of place, reawakening the desire to update our homes. Decorating, you may think, as you recall better halves digging in their heels, grumpy children and weeks of tripping over building supplies as you go from one room to another. Relax! It is perfectly possible to change a lot, with very little – in a very short space of time. And stay completely up-to-date on the colour front at the same time. To prove the flexibility afforded by a neutral sofa, we conducted an experiment. 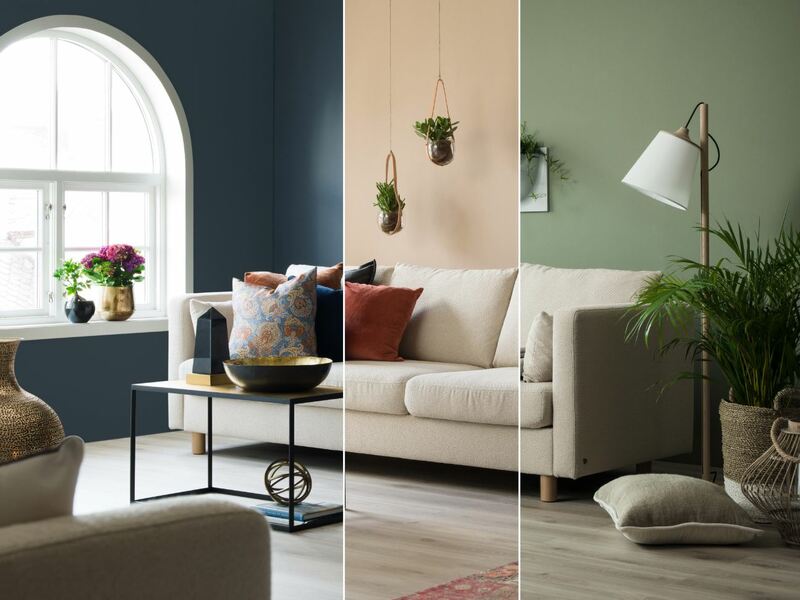 Taking the same sofa as our starting point, we present one living room in three of this year’s trend-setting shades: fresh green, soothing red and deep blue. Here is the result. We hope you will find the inspiration to do a little makeover magic in your own home, too! Green has been a popular colour for several years – and 2018 is no exception. Pale and delicate green shades create a calm and harmonious atmosphere. They are also easy to combine with other colours you already have in your home. 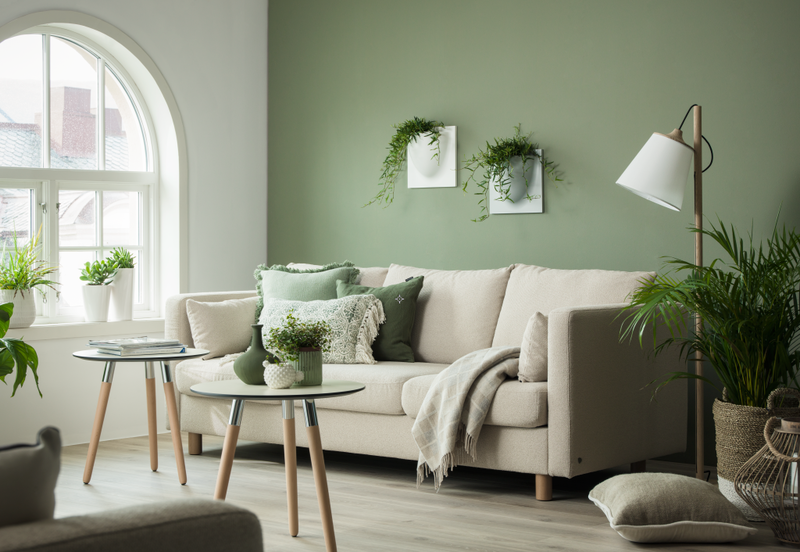 Green and white, combined with natural shades and green plants. Warm, red tones will feature prominently in up-coming interior design presentations. Warming shades of red are the perfect antidote when outdoor temperatures are falling. 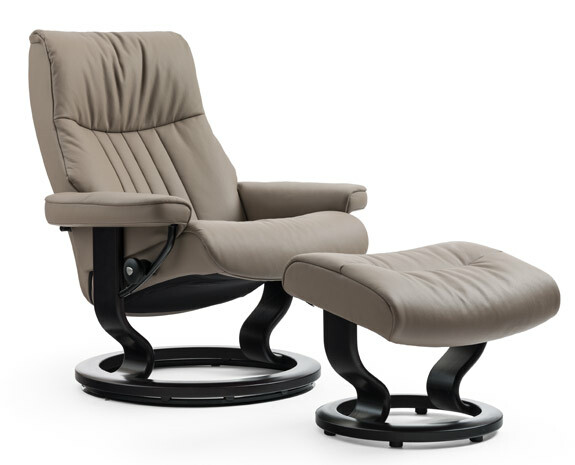 They are ideal for a room that is intended to be both a place for socialising and somewhere you can hide away and recharge your batteries. We have chosen to paint the wall in a pale reddish tone (Jotun Senses). The colour is followed through in the interior furnishings. Clean lines and dark steel elements provide contrast and balance, and prevent the overall look from becoming too sugary sweet. Deep blush and burnt reds with dark steel elements to add warmth to a room. Deep-blue shades are on trend for 2018 and we are also seeing this on the catwalks in fashion capitals worldwide. This is the colour of sophistication and creativity. Dark rooms are challenging to furnish, so you need to think carefully about what you fill them with. Accents in golden shades and earth colours verging on the burnt help to emphasise the elegant look and help add reflection to a room. Even simple details can be highly effective. 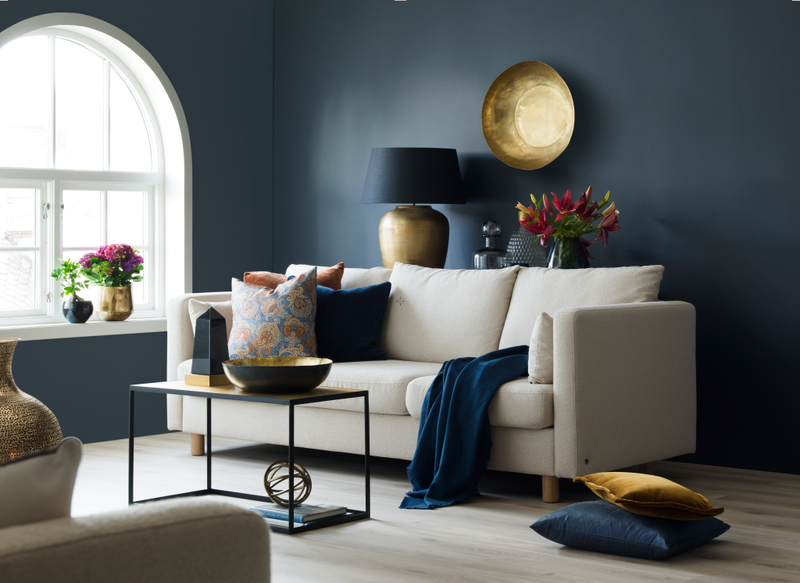 We found that our neutral sofa took on a completely different character against the deep-blue walls (Jotun Sophisticated Blue). Golden details and luxurious fabrics help to emphasise the sophisticated look.